The seed thought for our word today came from a recent “Minute with Maxwell” video by leadership guru John Maxwell. John says whenever he’s working with someone and they are not performing well he always asks two questions about that person: (1) Can he or she? And (2) Will he or she? “Can he” speaks to one’s ability. Sometimes an individual is trying to do something, but not being successful because they don’t possess the innate capacity to accomplish the task. Maybe they are unqualified. Lack the necessary skills. Or even the knowledge required to be successful. “Will he” is different. This has to do with one’s attitude. It is a word of choice. Of activity. Responsibility. And disposition. We all possess a “will” in which we can exercise control over our actions. While John was speaking of the issue of leadership and personal growth, I thought how true this is in regard to spiritual matters that impact our lives in every area. As for you, my son Solomon, know the God of your father, and serve Him with a loyal heart and with a willing mind; for the Lord searches all hearts and understands all the intent of the thoughts.” (1 Chron. 28:9). In every age, God has always expected us to serve Him with a “willing mind.” He knows our heart. Our attitude. And our very thoughts. He knows if we are truly willing to submit to Him in complete obedience. Later in this same speech, as David passed on the plans for building the Temple, he charged Solomon with his solemn words: “Be strong and of good courage, and do it; do not fear nor be dismayed, for the Lord God — my God — will be with you” (1 Chron 28:20). David further explained to accomplish this task it would require “willing craftsmen” and people who were “willing to consecrate” themselves to the Lord. ♦Are you willing to change? In a similar fashion, we could ask “are you willing” when it comes to your home. Are you willing to embrace your God-given role? To accept your responsibilities? To love your spouse? To provide spiritual teaching and training for your children? Some churches need to change. To return to the authority of Jesus’ mandate for the church. To grow. To fulfill God’s purpose and His directives for worship, discipleship, fellowship, ministry, and evangelistic outreach. Are you willing? Are spiritual leaders willing to challenge their members to be better? To do more? Are Christians willing to raise their level of commitment? 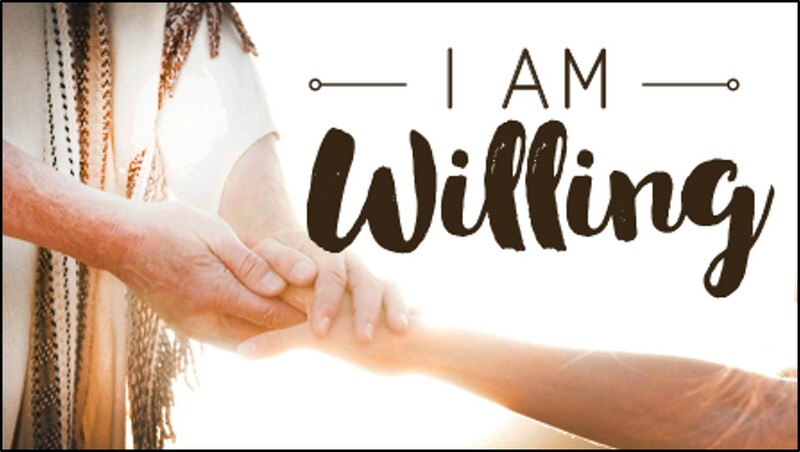 Once a leper came to Jesus and said, “If you are willing, you can make me clean?” Jesus responded, “I am willing” (Mk 1:40-41). Jesus is willing to cleanse your heart. Save your soul. Be your Savior. And lead you safely on a journey that is heavenward.